Cook the bacon in a large, deep skillet over medium-high heat for 3 to 4 minutes, until it is lightly browned and starting to crisp. Add the chopped chorizo; cook for 4 to 5 minutes, until it starts to brown and crisp. As it cooks, use a wooden spoon or spatula to break it into smaller pieces. Add the chopped onion and jalapeño; mix well and cook for 1 or 2 more minutes, letting them soften a bit. Add the tomatoes and mix well; cook for 3 to 4 minutes, stirring, until the tomatoes soften and appear mushy. Add the cooked beans and their cooking liquid; mix well and reduce the heat to medium. Cook for 8 to 10 minutes, until the beans are moist but not soupy. Add a bit more water if needed. Taste, and add more salt to your taste. Serve hot. Hola Pati, no se como explicarte cuanto e aprendido contigo y tu programa que me encanta. Voy a tratar los frijoles esta semana. Te confieso que no soy Mexicana pero me encantan experimentar nuevos sabores. Incluso mi comadre me paso una receta de pollo con crema y chile chipotle y a mi novio le encanta. Bendiciones para ti y tu familia. I just made these for my family…I was inspired after bringing out my cowboy boots for the fall. I changed it up a bit and instead of using chorizo I used paprika and cayenne pepper for flavor and color. Trying to watch our waistline. They were so good! Oh I love that your brought out your cowboy boots and were inspired, Patricia! So simple and so tasty. Thanks for sharing your recipes and culture. It’s always fun to watch your show and I never fail to learn something new! Oh thank you so much for tuning in Darah! What brand of chorizo do you use? Where I live in Texas I can find only the Cacique brand and am not a big fan of it. Could you please recommend any other brands that are good quality. Hola Pati! I’m a proud Tex-Mex mom & learned how to prepare Mexican food, local style, since chiquita. Pero mis frijoles han estado saliendo duro y crujiente! I’ve used local tap water for years, until a few years ago I noticed my beans came out bad! I tried bottled water, (drinking, purifed, &/or spring), soaking & unsoaking beans but I lost my touch & haven’t made in a while! I’d use HEB’s pinto beans, freshly packaged, in light to medium brown color, sort, clean and rinse until clear. I season with salt pork, garlic clove, & later add onion, tomato and salt. I really want to try this recipe, but my beans…yuk. Suggestions? Gracias! Hm. 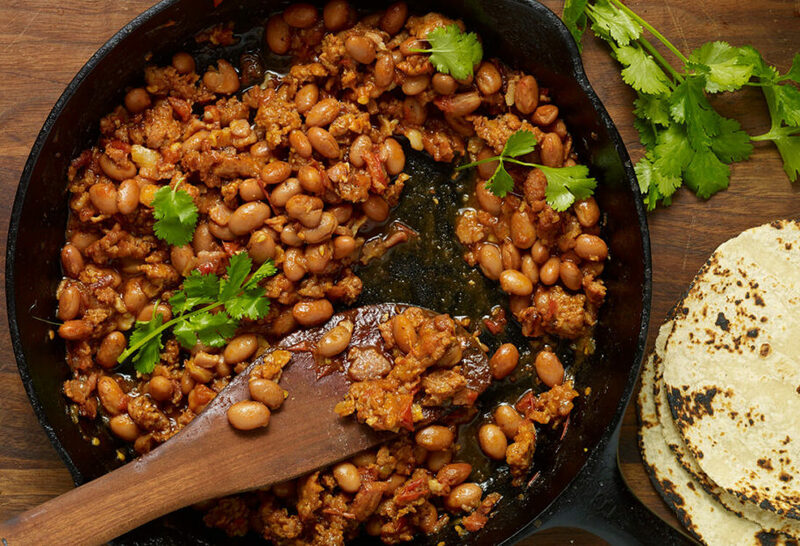 Please use this recipe to cook the beans (works for black or pinto or others just as well…), don’t add salt UNTIL the beans are already cooked and soft and once cooked, season them and cook them with whatever ingredients you wish, including charro beans! This is a crowd pleaser! One of my favorite side dishes to share. I prefer the crunchiness of thick cut bacon. So happy to hear that it is a crowd pleaser Molly!